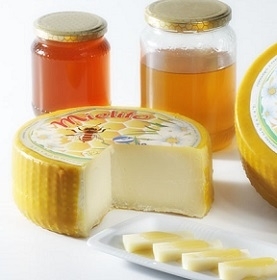 Mielito is an Italian cheese made in northern Italy’s Veneto region, named for the word miele, or honey. A delightful table cheese, it is made with pasteurized whole milk, aged for 30 days and encased in beeswax. The pate is straw yellow, compact and firm and flavor is slightly sweet and buttery, with a distinctiveness given by its beeswax encasing.